Are your beauty products actually organic? Our skin is our body’s largest organ, and what we put on it usually gets absorbed into our bloodstream. Many non-organic products have been found to contain harmful, non-biodegradable chemicals with negative impacts on human health and the environment. For example, it is estimated that 90% of non-organic cosmetics contain parabens which are made from petrochemicals. They are known to disrupt hormones and are linked to breast cancer. Phthalates are another commonly found ingredient in non-organic products. They’re made of oestrogen minis and gender bending chemicals that can leech out and contribute towards infertility amongst other issues. Certified organic products on the other hand adhere to strict rules that limit if not abolish any ingredients that are harmful to human health. Certified organic ingredients are those from organic farming, which are free from manufactured herbicides and artificial fertilisers. This type of farming is considered wildlife-friendly and more environmentally sustainable. With the lack of a legal standard, the Soil Association have teamed up with four European partners, BDIH, Cosmebio, Ecocert and ICEA, to develop a new global standard for organic cosmetics named COSMOS. This standard means brands cannot test on animals, contain GM ingredients, use artificial colours or fragrances or silicone oils or derivatives, as well as ensuring organic farming practices. If products are oil based, then 95% of ingredients must be organic for COSMOS Organic Certification. 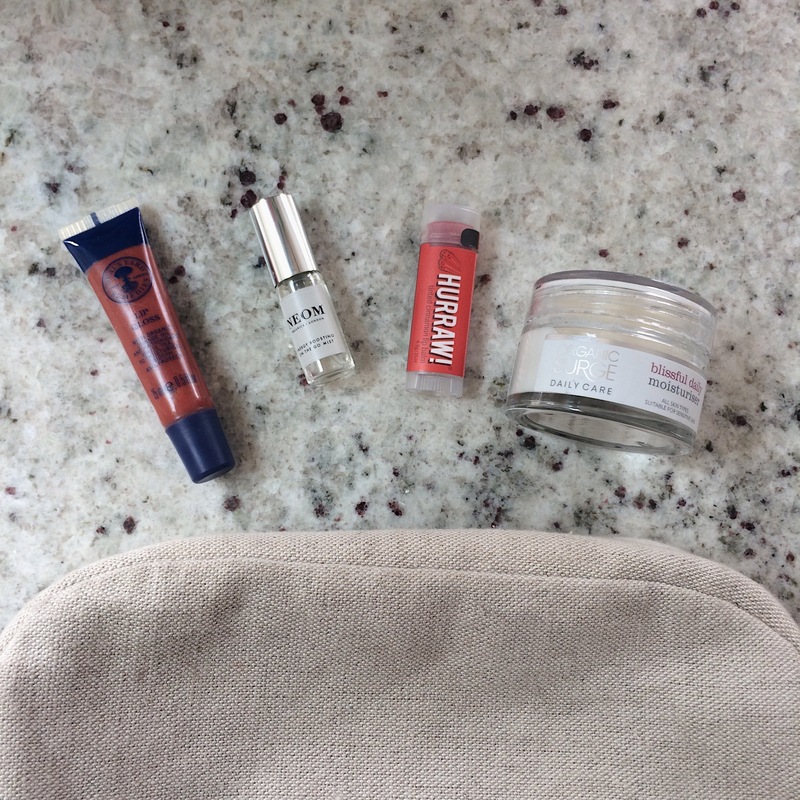 Whilst it’s not a beauty product, I thought I’d include it anyway as I love this travel bag! As soon as I set my eyes on it I knew I wanted it, and everyday it makes me smile. It’s the perfect size for me as I can keep all of my shower products in there for after my barre classes. As per the Veryan website, it has a GOTS certified (Global Organic Textile Standard) organic cotton shell and poplin lining. Their latest version is a beautiful navy and white stripe. Shop it here. So I might be a little obsessed with NEOM’s energy products – the citrusy scents are divine! This little energy boosting mist stays with me everyday in my Veryan travel bag and is perfect before exercising. It contains 87% certified organic ingredients which NEOM told me are certified by the Soil Association. So whilst their finished products aren’t certified organic, the ingredients they state are organic are. And they promise to never, ever use any synthetic ingredients petrochemicals, SLS, parabens, PEGs or silicone. Shop the latest energy burst mist here. This moisturiser is light and makes my skin feel beautifully soft. It’s certified by ECOCERT Greenlife as natural and organic, with 99% of ingredients natural and 17% organic. The webpage also shows which ingredients are certified organic. Click here to read more. These balms are great! I often suffer from dry lips, so keeping one of these little balms in my pocket is perfect. They’re labelled to contain “premium organic, vegan and raw” ingredients, and the website states that twenty of their balms contain over 70% certified organic ingredients, with the remaining four over 43%. Hurraw! Balm are currently in the process of being certified by the Montana Department of Agriculture for NSF as well as a certified organic handler, and by the fall of this year they will be listing the organic percentage information on their ingredients panel. Click here to find out more. Neal’s Yard Remedies have multiple awards or certifications, including Soil Association Organic Certification, Vegetarian Society Approved, Cruelty Free International and Ethical Company Good Shopping Guide. Whilst this particular gloss is being discontinued, I will definitely shop with Neal’s Yard Remedies again. Click here to get your own gloss before they’re discontinued! The OrganicHead promise on the back of the bottle states “All of our products are made with natural plant derived ingredients enhanced with extracts and organic essential oils. No sodium laurel/laureth sulphates and no parabens”. I couldn’t find anything on the website regarding whether the organic ingredients are certified, but I’ve emailed to ask so I’ll update this post if I get a response! Visit their website here.